Made from trusted materials in Port Everglades, Concrete Vent Blocks from Atlantic Coast Precast are cost-effective and built to last. There are many advantages to utilizing precast concrete for your project and even more advantages to installing functional or decorative vent blocks at your property. Our team can offer decades of experience, and is proud to work with any designers, engineers, architects, contractors or other industry professionals. In your home or commercial space, moisture can become trapped in the structure of your building, creating the perfect habitat for costly invaders like mold, mildew, damp rot, and termites. With our Port Everglades concrete vent blocks you can maintain adequate circulation by allowing fresh air and natural light to pass through freely. The result is a naturally cooling, private, and beautiful feature that is durable and personalized. In Port Everglades, our concrete vent blocks can arrive in a variety of styles, colors, shapes, and sizes to match your building. 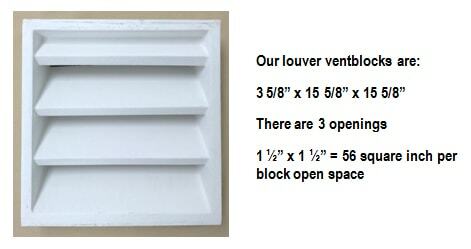 Also called breeze-blocks or pattern blocks, our vent blocks are sustainable, cost-effective, and comes with a galvanized frame for extra strength. For a bold partition, visual effect, to add character, or to maintain a cool, dry environment, call Atlantic Coast Precast for a free quote to get started.